Discussion in 'Cold Thermogenesis' started by Phil, Dec 4, 2018. I have to say the green house idea was awesome. 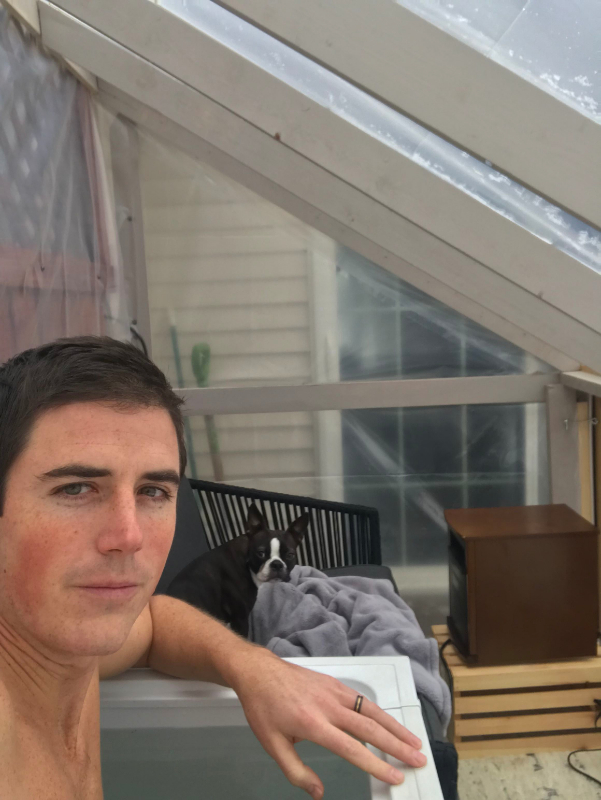 I built a green house at the beginning of November and moved my freezer cold tub into it. I also have a couch so I can sit in there for some of the day. My dog hates the cold, but absolutely love laying in there. I also have a small desk in there so I to do all my computer work. Like Toronto, November has been one of the cloudiest months for Minneapolis. On a cloudy day the greenhouse is pretty cold so I run on a space heater in it for an hour before I get into it. It will sit around 40°during the day when the outdoor temp is around 20°. When the sun is shining it doesn't matter what the air temp is, you get pretty hot from the sun. Sitting in the greenhouse feels pretty amazing, you forget its winter. I really enjoy doing CT in the greenhouse vs the darkness of my basement. The Greenhouse plastic refracts the red and IR light everywhere so I am actually getting way more light inside the cold tub then if it were outside. UV-A light would penetrate the plastic. It makes a lot of sense to me that you want the red and IR light from the sun while doing CT. It should help boost the benefits and adapt quicker. I did bulletproof coffee style intermittent fasting for 5 years. A year ago I ditched the coffee, morning fasts, supplements. MCT oil, and drastically reduced the amount of veggies I eat. For the last year I've been eating my largest meal at breakfast, pretty much Eggs, sausage, steak, bacon, bone broth, butter and fish eggs. I used to hate seafood and avoid it at all costs. For the last year I've been eating raw oysters twice a week. I'm eating salmon and walleye I buy from a local guy who catches them. He also gives me all the salmon eggs I want for free. I eat a good amount of salmon eggs every morning before doing CT. I'm still eating carbs, but its only coming from eating squash and pumpkin. Most of the food I eat is all local, meat, fish, cheese, butter, and eggs. The only water I'm drinking is Buhl water. I can buy a gallon of it for 1.50 and it comes from a northern Minnesota glacial aquifer 700 feet deep encased in granite. I would be really interested in getting this water tested for its deuterium levels, but I'm guessing they are pretty good. I also will drink aquifina and voss here and there. MITpowered26, Christine_L, KrusinWitchie and 4 others like this. 2 weeks ago I did CT in a local lake. I don't know the temp, the water wasn't completely frozen. I underestimated the difference between the lake water and the 55° I was used to. I sat in the lake water for 10 Minutes, it was really windy and the air temp was 20°. I ended up getting mild burns on my leg, groin and ribs. They were very sore for a week after doing this. No visible damage to the skin, only muscle soreness the days fallowing. I could tell I pushed it too far after getting out. It really crushed my immune system and ability to think for several hours. I went and did this with several other people, I wouldn't say they are cold adapted. They did the exact same time as me and had no issues. It might have to do with the fact that I'm very lean and muscular compared to the other folks who had a lot more body fat. I was fine after a week and I'm going to stick with 50-55°. I feel I am better off doing longer CT at warmer water temps. For now I see no reason to go any colder. My freezer/cold tub wants to drop below 50° even though it is in the greenhouse and the water is insulated in the freezer. I use a sues vide device when I need to heat up the water above 50°. I drain the cold tub once a week and start off with warm water, its cools to the desired temp pretty quickly. KrusinWitchie, Sheddie, recoen and 1 other person like this. Wow, you’re really rockin it! Good job and very inspiring. You must have some very hardy and equally adventurous friends! Good idea. I think that may be a great way of manage CT for the winter. I like the idea with the sues vide device too. I remember in India they used these over sized coffee cup coil warmer gadgets, that with 220 volts and metal buckets and wet bare feet on concrete floors. It was a nice good way to get punched by 220v every morning. Needless to say few left the bathing area sleepy. LOL. Have you noticed extra benefits by increasing your CT? Good job! Do you shiver at all during CT? Or did you use to? I start to shiver a little about 20-30 min into it. I shiver the most when I get out for about 30 minutes. When the sun is fully shining In the greenhouse I don’t shiver at all and it’s easier to want to stay in for longer periods of time. When I get out I will usually lightly jump on my trampoline for a few minutes to warm back up. Really my only health issues have been pretty bad food/seasonal allergies, bad sinus issues my entire life. I also have Esophagitis, which sometime makes it hard to swallow, I will choke on food and sometime even water. I used to think I could control them with strict diet. Doubling down on controlling light, ice baths and getting sun has done way more then diet alone has ever done. My gauge for if something is working or a gauge on my health is if my sinuses are clear, no runny nose and no issues swallowing. If I got an itchy throat from something I ate I used to blame the food quality/mold (sort of the Dave Aspray approach to mold and food), but I don’t really have that issue anymore. In the summer I noticed if I got a lot of sun and controlled light at night I could eat just about anything and have no issues. I do feel like the CT is sort of making up for the lack of sun. I was in New York City 2 weeks ago and then Indianapolis last week. All I wanted to do was sit in my cold tub or I wished I was on the beach. Getting into and staying in the cold tub is way easier when the sun is shining in the greenhouse and I’m getting a lot of IR light. CT goes from being difficult/unenjoyable to being very nice, easy and relaxing. Seriously, the greenhouse is amazing. It’s 24 degrees outside and It’s 61 in here. I’ve been sitting in here for 30 minutes and have no desire to get out. If I was in my basement I would be watching the timer, shivering and excited to get out. Christine_L, KrusinWitchie, Stephen W and 1 other person like this. That’s a great effort. I’m hoping when I can cold adapt my allergy will slowly diminish. I can’t do half that without shivering for nearly 2 hours later. I have a significant dust mite allergy, so I’ve always got a stuffy nose (not too much snot, just swollen turbinates). I use a sues vide device when I need to heat up the water above 50°. I drain the cold tub once a week and start off with warm water, its cools to the desired temp pretty quickly. Solid ideas, Phil. Thank you for sharing them with everyone! Have you run into any problems draining the CT water in these low temps? I am thinking about it now and I wouldn’t know where to direct the water. Definitely not into the driveway! I have not run into any issues with draining. I siphon the water with a 75 foot hose down a hill towards my neighbors where most the rain/snow melt would drain. After draining it I clean it with a very diluted solution of bleach and water. I fill the freezer up with the same hose, I run it to my bathroom shower. I had to cut the end of the hose and then make a half inch slit so that i could get the end of the hose onto the shower nozzle. I use this 15cu-ft freezer, I have found it to be pretty good. All I did was seal all the cracks with silicon. If I used a metal trough the water would freeze over pretty quickly. In the freezer the water temp drops about 2-3°F per day. Indoors to keep the water at between 50-55° I only had to plug in the freezer for an hour every 2-3 days. If I keep the freezer outdoors in the summer I assume I will have to plug it in for 1 hr per day. I fill it up with warm water, I keep the lid open and the temp drops down to 55°pretty quickly or I can plug it in for a a few hours. I have my wife doing CT when the water is around 70° since she won't get into it when its colder. I don't mind sitting in the 70° for an hour+, I'm still getting benefits. I guess I should also say it cost me around $120 and 4 hours to build the greenhouse. I used a 16'x25' sheet of this Greenhouse Polyethylene plastic. Then I built a frame out of 2x4 and 1x4 wood that was pretty cheap. I didn't use any instructions, I just started building, it's way more fun that way. I wrapped the plastic around the entire thing, even the base. I cut separate pieces of plastic for the sides. To attach the plastic I used 1 inch screws that have rubber washers attached to them already. I sealed all the crack with window tape used to patch broken windows. The hardest part was building a door. For the first two weeks I just had an open flap that I held down with a weight, you could also use Velcro or something. 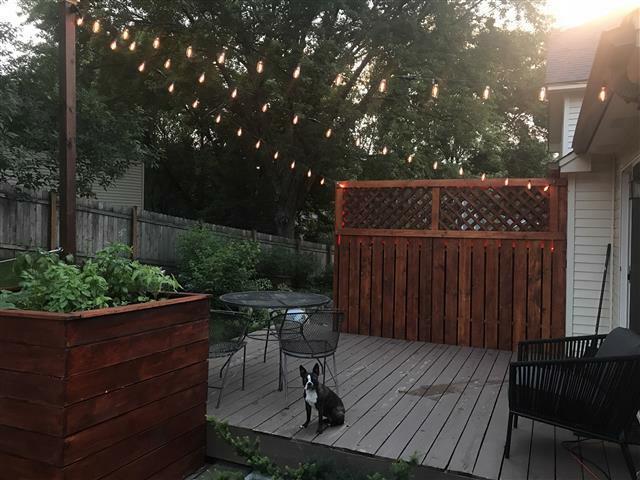 I sort of cheated and built the greenhouse against this privacy wall I build to block the neighbors so we can lay out naked in our yard. Note: in the picture there are lightbulbs, those have only been turned on once for the 1 house party we had. This wall adds most the support and makes it so I don't have to worry about strong winds tearing it down. 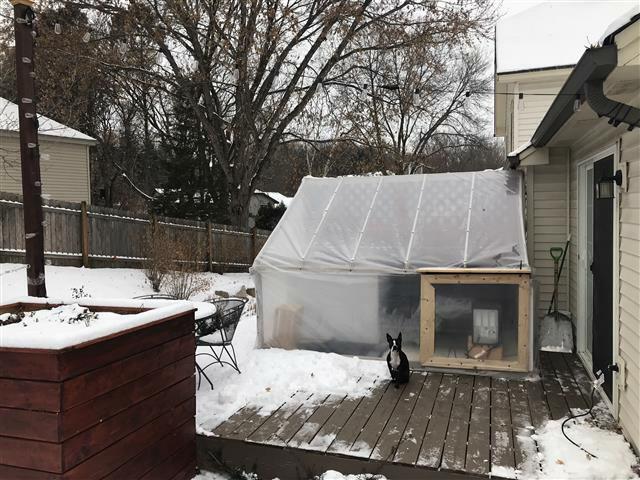 I will probably tear the greenhouse down in late spring. I might use the same wood from last year, I'll buy new plastic to build it again next winter. I won't ever do CT inside again, I will have the freezer outside during the summer and in the greenhouse in the winter. MITpowered26, Christine_L, KrusinWitchie and 2 others like this. NIce Job. I look forward to making mine. Usually greenhouse plastic will last 5 years so you can reuse it. Strangely I found I am able to warm up better if I exercise before than after which makes no intuitive sense, but hey it works.